PREVIEW:Intex South Asia provides a one-stop comprehensive sourcing & trading platform for global apparel manufactures, international sourcing & buying offices, buying houses, apparel brands & retailers, etc. 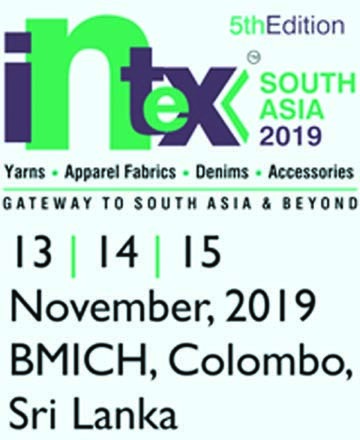 to connect and network with quality suppliers of fibers, yarns, apparel & denim fabrics, clothing accessories, dyes & chemicals and allied services from South Asia, South-East Asia and other international markets. Since its launch in 2015, Intex South Asia has successfully connected with professional trade buyers from more than 35 countries and regions with an excellent growth of more than 30% in exhibitors’ year-on year basis. Thus, making Intex South Asia the largest and only international textiles sourcing platform of South Asia that brings together the entire supply-chain and value-chain of the textiles and apparel industry under one strong trading platform.